Whether we live in cities, suburbs, or villages, we are encroaching on nature, and it in one way or another perseveres. Naturalist Susan Shetterly looks at how animals, humans, and plants share the land—observing her own neighborhood in rural Maine. She tells tales of the locals (humans, yes, but also snowshoe hares, raccoons, bobcats, turtles, salmon, ravens, hummingbirds, cormorants, sandpipers, and spring peepers). She expertly shows us how they all make their way in an ever-changing habitat. In writing about a displaced garter snake, witnessing the paving of a beloved dirt road, trapping a cricket with her young son, rescuing a fledgling raven, or the town's joy at the return of the alewife migration, Shetterly issues warnings even as she pays tribute to the resilience that abounds. Like the works of Annie Dillard and Aldo Leopold, Settled in the Wild takes a magnifying glass to the wildness that surrounds us. 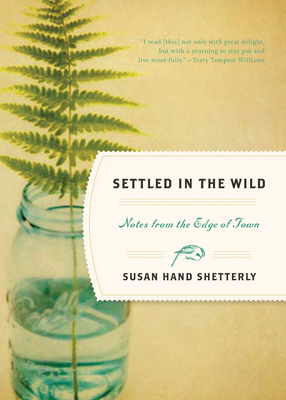 With keen perception and wit, Shetterly offers us an education in nature, one that should inspire us to preserve it.